This note introduces the vertex proper connection number of a graph and provides a relationship to the chromatic number of minimally connected subgraphs. 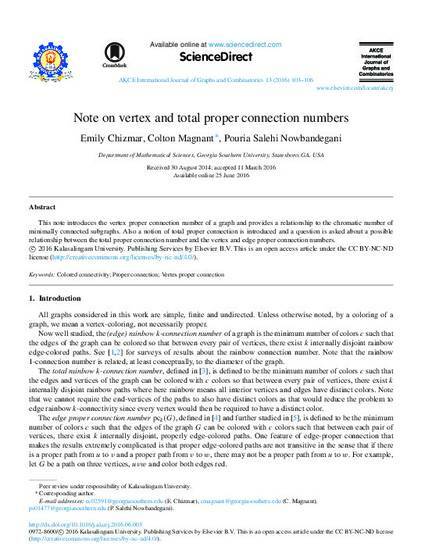 Also a notion of total proper connection is introduced and a question is asked about a possible relationship between the total proper connection number and the vertex and edge proper connection numbers. © 2016 Kalasalingam University. Publishing Services by Elsevier B.V. This is an open access article under the CC BY-NC-ND license (http://creativecommons.org/licenses/by-nc-nd/4.0/). This article was retrieved from the AKCE International Journal of Graphs and Combinatorics.